Robert Patterson spent 30+ years with UN Food and Agriculture Organization in Africa, Latin America, Europe, the USA and Canada, focusing on project/program design and implementation, always with an emphasis on small-scale, community-oriented initiatives, horticulture and nutrition. Field-level experience taught him that simple solutions are the best solutions, and that lasting progress can be made without huge capital inputs, high operating costs and, often, without motors. 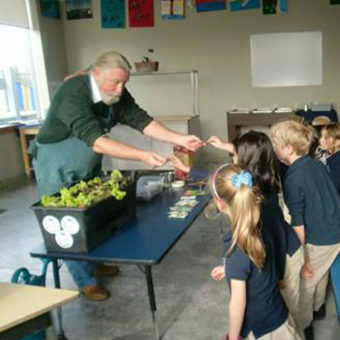 Robert has built sustainable vegetable gardens at schools, clinics and with communities all over the world. Dedicated to "Health and Taste at the Doorstep", iIn 2011, Robert and his partners founded EcoHuerto, in Mexico (www.ecohuerto.mx), and in 2015 he returned to Canada to initiate The Growing Connection. Robert is a graduate of the Univ. of Guelph and Carleton U’s School of Int’l Affairs, and is Managing Director of TGC (www.thegrowingconnection.com).